Friday, February 29, 2008 at 8:00 p.m. 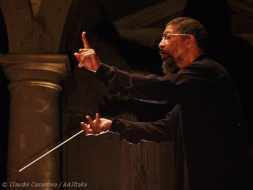 World-renowned conductor/composer/innovator Lawrence D. 'Butch' Morris conducts B.I.O. — the Buffalo Improvisers Orchestra live in Asbury Hall! Jenece Gerber (voice), Geoff Perry (violin), Mary Ramsey (viola), Jonathan Golove (cello), Greg Piontek (contrabass), Stuart Fuchs (acoustic guitar), Joe Rozler (piano), Michael Colquhoun (flutes), Mike Allard (alto sax), Steve Baczkowski (tenor sax-bass clarinet), Rey Scott (baritone-soprano sax-oboe), Bill Sack (electric guitar-prepared lap steel guitar), J.T. Rinker (laptop-live sampling), Dave DeWitt (tuba), Andrew Peruzzini (trumpet), Jim Whitefield (trombone), Ravi Padmanabha (tabla-percussion), John Bacon (vibraphone- percussion), Ringo Brill (djembe-congas-percussion). con duc'tion (-duk'shun), n. 1. Act of conducting or conveying, as water through a pipe 2. Physics. Transmission through or by means of a conductor; also conductivity; —distinguished in the case of heat, from convection and radiation. 3. Physiology. The transmission of excitation through living tissue, esp. in a nerve. Conduction® (conducted Improvisation) is a means by which a conductor may compose, (re)orchestrate, (re)arrange and sculpt with notated and non-notated music. 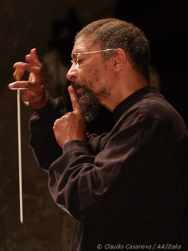 Using a vocabulary of signs and gestures, many within the general glossary of traditional conducting, the conductor may alter or initiate rhythm, melody, harmony, not to exclude the development of form/structure, both extended and common, and the instantaneous change in articulation, phrasing, and meter. Indefinite repeats of a phrase or measures may now be at the discretion of the new Composer on the Podium. Signs such as Memory may be utilized to recall a particular moment and Literal Movement is a gesture used as a real-time graphic notation. Conducting is no longer a mere method for an interpretation but a viable connection to the process of composition and the process itself. The act of Conduction is a vocabulary for the improvising ensemble. In the past fifty years the international community of improvisers has grown at such a rate that it has forged its own in defining its present future. The geographic exchange of musics (not category) has enriched this community and holds it steadfast in its mission to be the medium with an appetite for expressing the moment. It is this Collective Imagination that is presenting the new challenge to technology and tradition with the hope of helping in the humanitarian need to broaden the language of communication. Here and now we have the possibility of helping to open new doors of employment to a community that has patiently awaited its turn to pave the way to the New Tradition, a product equal to the challenge.